Bellhound Choir is a solo project by Christian Hede Madsen from Copenhagen. His debut album ‘Imagine The Crackle’ was already recorded last year but is now set for release May 20th 2016 on Bad Afro Records who was intrigued by the dark and stripped down alternative blues vibe of the album. In late 2015 Bellhound Choir released the EP ‘Stray Screech Beast’ on Lay Bare Recordings in Holland. Soon after he went on a three week European tour in December with John Garcia (the former vocalist of the groundbreaking stoner rock band Kyuss). The tour went so well that they will go on another three week European tour in May and June 2016 visiting places that were not included the first time around. In addition three songs from ‘Stray Screetch Beast’ ended up in the Ulrik Thomsen movie ‘In Embryo’. Bellhound Choir has a preference for the blues but there is nothing nostalgic about the music. It’s very here and now and is mixed up with alternative folk that is both gloomy and melancholic. 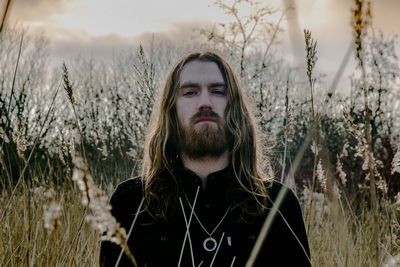 Christian Hede Madsen has a past in the Danish stoner rock band Pet The Preacher which also shines through in the music and all together it ends up sounding like some sort of Scandinavian blues noir. Dramatic and spiritual. ‘Imagine The Crackle’ has a dark soul and sometimes it sounds like judgment day is just around the corner. The album is produced by Sebastian Wolff from Keldermench (who is also playing drums on the nine songs) and mixed by Steffen Sørensen. Together they have done a great job at facilitating the black-eyed mood of the songs. Three of them are graced with the beautiful voice of Camilla Munck who take no prisoners in a song like “Slow Pain”.